There were several great announcements this year at #TwitterFlight...a new Twitter for Mac client, a Tweet composer for previewing messages before you embed them, GNIP Insights APIs, and a genuine effort to connect with developers after a strained relationship - just to name a few. The item that held my attention long after the keynote announcement was Publish. Why? Because it is all about storytelling (which I believe Twitter has struggled with for some time). For many, the Twitter stream moves too fast, it's not really threaded (technically it is, but that's not accessible enough for the average user), and finding conversations around a topic are often described by power users as "gathering around a hashtag" - which is great if you were raised using Twitter and not new to the platform. So for those of us using Twitter regularly this is all old hat. When it comes to expanding the existing user base, these issues have proven to be overwhelming. Which leads me to Publish and the idea of storytelling on Twitter. For the brand marketer, storytelling is at the heart of what you do and Twitter is too complex of an environment to warrant significant time and attention. So how can we take all of that great content on Twitter and organize it in a structure that both reflects modern habits (mobile + streams + ephemeral) but also remains accessible to the largest possible user base? It feels like this was the question being asked when developing Publish. While Moments is Twitter's first serious attempt as a storytelling platform, Publish feels like a democratizing extension of Moments. After using Publish for just a few minutes, I was able to create the embedded series of Tweets below based on what I thought were the most significant keynote announcements from #TwitterFlight. Take this a step further and you have a powerful platform for your brand's story. How about a collection of curated tweets (with embedded media like videos, images, and polls) from your brand conference (kind of feels like Storify)? Or a collection of tweets from your employee's after a day of volunteering for a cause everyone believes in? Or a collection of Tweets from your customers? Those are just a few examples of the kinds of stories you can craft using the new Publish tool. And now you can do this in a modern environment that feels more organized and structured than anything Twitter has done in the past. Using Publish, you can tell your brand story on Twitter and remain relevant to the largest possible user base regardless of their comfort level with Twitter. Twitter, you've got my attention now. There is no doubt that my thinking about this post has been influenced by Jeff Jarvis and his desire to democratize the most fundamental of media units - the story. See here, here, here, and here. Once a year, the Ofcom Global Media and Communications report is released. This is a UK focused report that is 363 pages (PDF download here) of insight and analysis on the communications sector. Let me save you some time and pull out the one chart that absolutely blew me away. Do you see that? Respondents in China overwhelmingly use mobile payment services for non-digital goods ("real stuff") in comparison to the rest of the world. For all of the talk here in the West about the mobile wallet and how Apple Pay is helping to spur growth, it would seem that this digital unicorn has already arrived. Just not here. 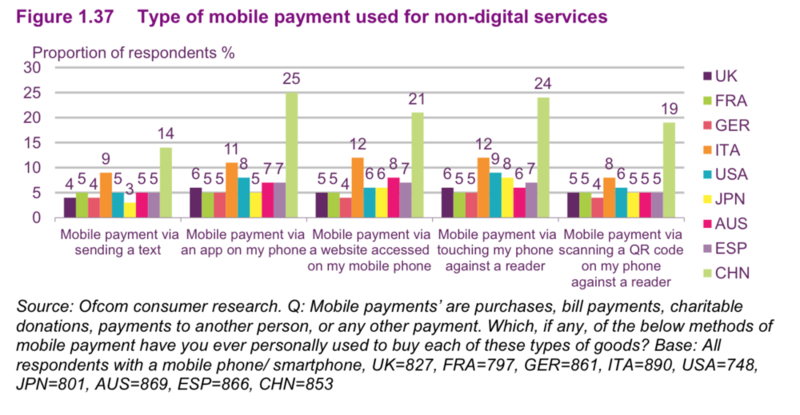 So for those who have used a mobile payments system, what are they buying? Take a look at this chart. China continues to lead in terms of adoption across product categories. So what's going on here? My suspicion is that mobile adoption in China is very commonly a "one device to rule them all" purchase. That is, consumers buy a phone (often a phablet) and use that one device for all of their computing needs. So it seems very natural that, as the middle class in China continues to explode, these new consumers are ready to adopt mobile payments systems because it is all they know. Over here in the West? We still seem stuck in our ways and the only thing moving the needle appears to be massive data breaches. We now have a platform with over 1.2 BILLION people that allows for an unprecedented level of communication for businesses. So what, right? I believe there is a common theme among small businesses when you ask them why they use social media, specifically Facebook, as part of their overall marketing strategy. They want to 1) grow their business (shocking, I know) and 2) are looking to the major social networks as a way to enable said growth. What likely stops many from really diving in is a simple question. “What?” – What should I post and why would anyone care about it? It’s a challenging question but there are guideposts that will always steer you in the right direction. Three of those guideposts are detailed below. When your car breaks down, you are faced with a challenge. It’s a complex machine and you need to trust the mechanic that diagnoses your problem. But trust is not something that happens automatically. People trust people, yes. So make your business authentic on Facebook. Make it about your employees and let their personalities shine through. Potential customers will feel more comfortable knowing that John on Facebook (you know, the one that dressed in his favorite Halloween costume in October) is the same John answering phone calls and giving you advice. Your business has a personality and a culture. It comes directly from your employees so show it off! There is no denying Facebook as a visual medium. If you sell pizza, or jewelry, or any service that can be represented visually then use this to your advantage. Post pictures of your product - scratch that - of customers enjoying your product. Then hit the easy button. What’s the easy button? It’s called a boost. You can boost any post on your Facebook page with just a few dollars. This boost allows you to reach a much larger audience than you normally would. It’s easy to track performance of the boost and it’s easy to set one up. Facebook has done the targeting and pricing work for you. This easy button is the first place you should star when looking to spend advertising dollars on Facebook. Consider it a starter kit. Facebook knows that you are 35 years old, married for 10 years, have 2 children and run a small business focused on bringing more educational tools to your local private schools. Wow. That’s a lot of information. Now turn the tables. If Facebook knows this about you, how you can you use this type of targeting information to reach your potential customers? The targeting options within the Facebook advertising tools should not be ignored. Learn the basic ad interface and use it to your advantage. Do you sell high-end, colorful bakeware for home chefs? You can find prospects on Facebook and target them with very specific messages. They are out there. Trust me. I checked before posting this article and found 6.6 million of them in the US and Canada. These are just 3 things you should be paying attention to when marketing your small business on Facebook. There are many, many others. I'll write more about this in a few upcoming posts. There are three significant items to take away from the most recent Apple event (at the historically significant Flint Center in Cupertino, CA). The iPhone 6 and 6 Plus are the direct result of growing market pressure on Apple to offer larger phones. Apple Pay has the potential to catapult company revenue to levels we have not seen in any other company. Ever. The Apple Watch is a first generation offering. I didn't buy the first generation iPod, or the first generation iPhone, or the first generation iPad. The watch is no different. However, I am very much looking forward to watching Apple iterate on the now public commitment to each and every one of our wrists. Spend 10 minutes with Ed Kless on a recent podcast we recorded and dig into the details of the three items above. The single most significant item is the timing of Apple Pay. I kept waiting for a journalist to connect the dots between why Apple is "suddenly" interested in including NFC in their phones and the new chip-and-pin standard headed our way. In October 2015, gone will be the days of magnetic stripe credit cards as we usher in a new era of chip and pin (conveniently, something you have and something you know for the security buffs out there). This will create an environment of mass adoption for the much needed NFC chips that have gone underutilized in mobile phones to date. Well done Michael Carney of Pando Daily. You win the prize. Are we turning a deaf ear to a powerful communications tool? Some think so and this recent podcast features a prominent speaker emphasizing how we, as brands, should truly be using social media as a platform.